The first time I went to Craters of the Moon National Park I was 4, and I earned my Junior Ranger badge. The second time I went to Craters of the Moon National Park I was 19 on a cross-country adventure, and it was the perfect stop between Boise and Yellowstone. Craters of the Moon is a large lava field in the middle of southern Idaho where visitors can hike up large craters and climb down into rocky caves. It’s aptly named: the lava terrain extends for miles around you, creating an isolating effect that truly feels like you’re on the moon–although, of course, your feet are firmly on the ground. Except for when they’re not. Climbing through the caves can get a bit precarious at times, but careful footing and a healthy sense of adventure alleviates any nerves. I’m convinced from our time at Craters of the Moon that Matt doesn’t have a nervous bone in his body. He thrives off adrenaline and thrill. He just goes for things and doesn’t worry about twisting his ankles or scraping his shins. And he’s so fast. Every time I looked up from the few rocks I’d traversed, he was deeper into the cave, nearly out of sight. 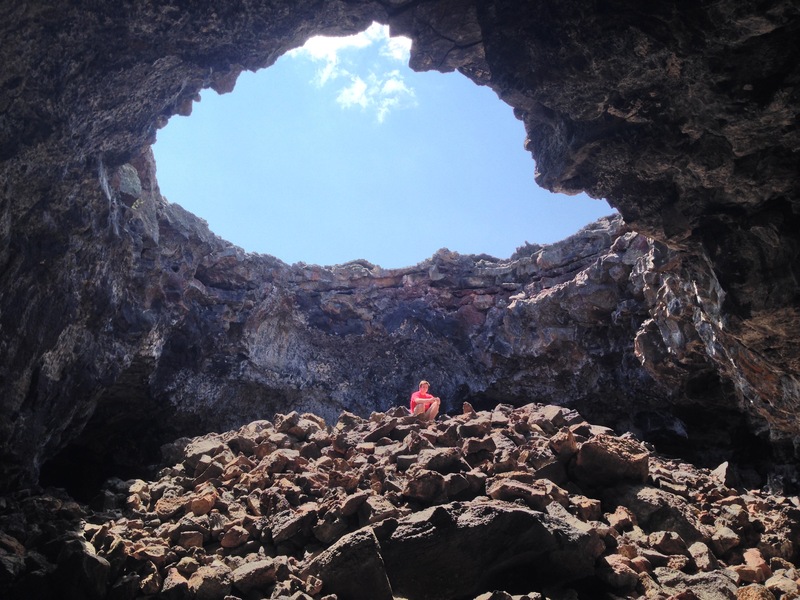 I admire that about him, but it also makes me nervous–I’m much more calculated than I am risky, and I cringed watching him clamor over wobbly lava rocks without a second thought. But I survived, and I had a blast feeling like a badass astronaut-rock climber hybrid in the lava beds. No Junior Ranger badge this time, but 4-year-old me would be proud to know I loved it just as much as an adult as I did the first time around. True! I love the Junior Ranger program, it’s a great way to grab kids’ attention. Wow, I love volcanic landscapes – the smell, the heat in the air, the rough and rugged look. I’ve only visited two and both were in Greece: Nissyros and Nea Kameni (the latter is within the former caldera of the island Thera). This didn’t have a distinctly volcanic smell but the heat and appearance were intense! I had no idea this existed – thanks for sharing! That last photo is a-w-e-s-o-m-e. Looks way more exotic than I ever would have expected Idaho to be. It’s kind of a diamond in the rough–when you drive up it goes from a normal landscape to lava beds INSTANTLY.